Dextrose, natural and artificial flavor, magnesium stearate, vegetable fibers, sucralose, silicon dioxide, Red 40, Blue 1. For adults and children 12 years and older: Chew 4 tablets per serving. Repeat as necessary; up to 12 tablets per day. Do not take if pregnant, breastfeeding, on medication or with a known medical condition unless you have consulted a physician. Protected with a tamper evident seal. 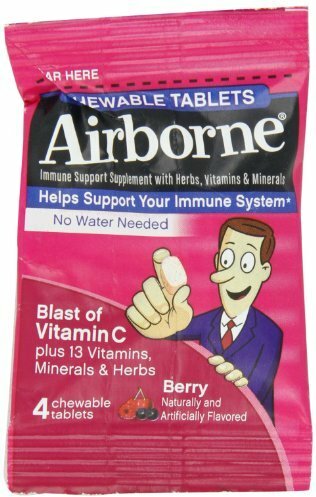 New Airborne Chewables are your immune system's cheerleaders. 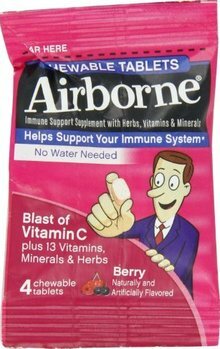 Your immune system's got a big job to do and supporting it just got more convenient thanks to Airborne Chewable tablets. We've included our powerful formula of 14 vitamins, minerals and herbs, including Zinc, Echinacea and a blast of Vitamin C into easy-to-chew tablets. Water not required. So give me a C! Give me an H! Give me an E-alright. You get the picture! Other Ingredients: Dextrose, natural and artificial flavor, magnesium stearate, vegetable fibers, sucralose, silicon dioxide, Red 40, Blue 1.